Chinese New Year falls this Friday, 31 January when the Year of the Horse gallops in. I have not lost my sense of childish excitement for this most important of all Chinese festivals, and still look forward to the decorations, festive goodies and frantic visiting that goes on in the first two intense days of the new year. What we didn’t have way back when was this ritual of ‘Lo Hei’, which came much later. My earliest memory of it was in the early 90s, when I had just started working. (Yes, do the math and you can guess my vintage.) These days, families and companies all find it necessary to partake of this to ensure good fortune at home and work for the rest of the year. Interestingly, this dish was created in Singapore by four pioneering Chinese chefs (whom we refer to as the “four heavenly kings”), and has spread to the Chines diaspora in other countries. It is well practised in Malaysia now, I believe, and only making headway lately into Hong Kong. 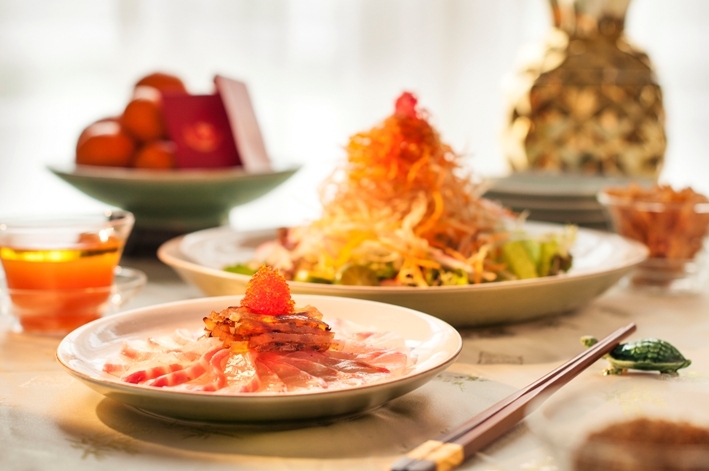 It’s a beautiful, festive dish of raw fish salad (called ‘yu sheng’) served on a large platter, with individual ingredients laid out nicely in layers. They often include shredded white radish, cucumbers, carrots, raw fish slices, condiments like crushed peanuts, deep fried wonton skins, sesame seeds and tangy aromatics like preserved ginger, candied orange peels, assorted pickles and the like. Of course, chefs do get creative and there are countless variations these days, from the sublime to the bizarre. All this is a visual feast, and once everyone is assembled at the table, we all stand up and toss the yu sheng salad together with our chopsticks. This custom is the ‘lohei’. It is highly ritualistic. Even as the various ingredients are added to the platter, there are auspicious sayings to accompany it. This is because the ingredients are laden with symbolism during this period. Lohei is a messy thing. You could have anywhere from 5 people to 18 tossing the salad with extra long lohei chopsticks. You can imagine the stray bits of vegetables that get accidentally flung onto the table by inaccurate or overzealous celebrants. But that’s all part of the fun – so long as the bulk of the salad stays in the plate, of course. The higher you toss, the luckier it is – and even with the tossing, more lucky sayings are yelled out. What bugs me though is that I can never remember what to say in that delightful ritual. Here in Singapore, Chinese language experts and seasoned waiters in Chinese restaurants do it best. (In fact there’s one impressive waiter at Wan Hao in Marriot Singapore who does it more slickly than anyone I have ever seen.) But the rest of us….well,…we just mumble along. And if your Chinese is as tragic as mine, you may only manage some pretty pedestrian sayings, which won’t do much to shore up the year’s luck. I always made a mental note to do better next year, but never got down to doing so….until now! Yay. 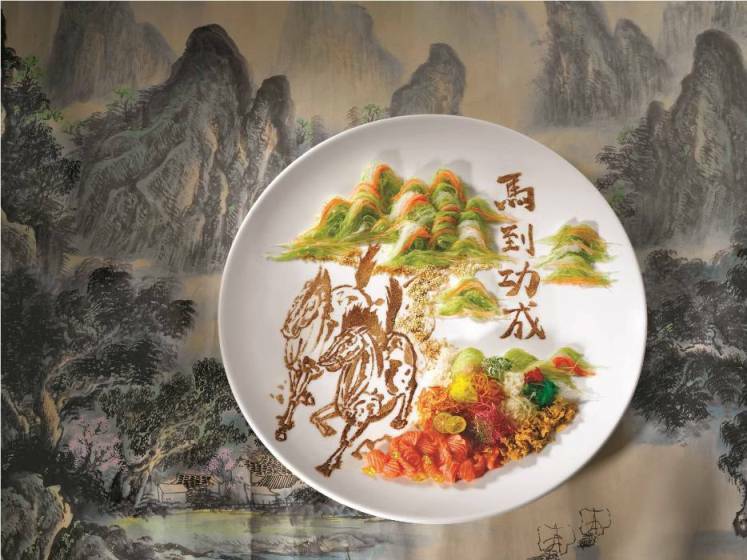 With the horse year galloping in, here’s the coveted list of auspicious sayings so we can lo hei with confidence and flair over the next 15 days of CNY. I think it sounds more impressive in Cantonese or Teochew, but what I have here are the sayings in Mandarin. If anyone knows the sayings in other dialects, it would be great if you can drop a comment. So here is the 12 Step Guide to Lo Hei with Flair and Confidence! Step 2: Add the fish, and say 年年有余 (nián nián yǒu yú). Everyone knows this phrase. What’s it mean? Not merely ‘everyday have fish’ but ‘abundance for the year’. Step 4: Sprinkle in the pepper and cinnamon powder for wealth. Say 招财进宝 (zhao cai jin bao). Step 7: Add the shredded carrots and say: 鸿运当头 (hóng yùn dāng tóu) for good luck. 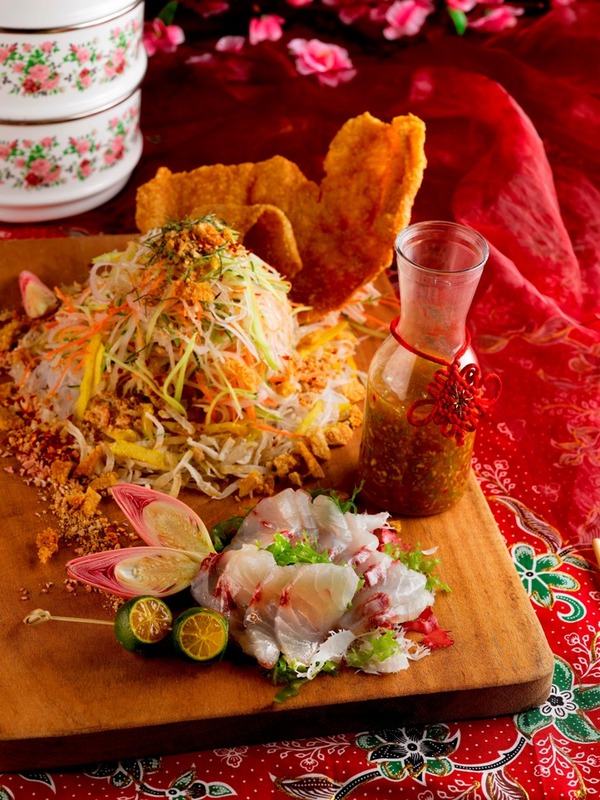 Step 12: Toss the yusheng 7 times with loud shouts of “Lo Hei”(捞起) and other auspicious new year wishes. I always look forward to CNY for this dish. yum yum!!! !